Be the first to share your favorite memory, photo or story of Joann. This memorial page is dedicated for family, friends and future generations to celebrate the life of their loved one. 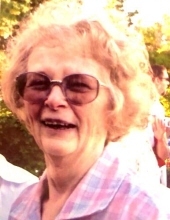 Joann Alvina Johnson (Gauer), 84, of Great Falls, passed away March 14, 2019. A memorial service will be held on Thursday, March 28 at 2:00 p.m. at O’Connor Memorial Chapel. Interment will immediately follow the service at Mt. Olivet Cemetery. Joann was born April 10, 1934 to Goddard and Dorothy Gauer (nee Mustard) in Lewistown, Montana. She grew up there, except for a short time during WWII when her father worked at Farragut Naval Training Station in Athol, Idaho. The family returned to Lewistown, and she graduated from Fergus County High School in 1952, being especially active in the FHA. After graduating, Joann worked for the Fergus County Extension Office as a secretary. She married William Dean Johnson of Stanford, Montana in September of 1960. They moved to Great Falls shortly thereafter and welcomed a son to their family in 1968. Joann was an avid seamstress, crafter of needlepoint, knitter, quilter, dressmaker, and alteration specialist. There was practically no crafting project beyond her capability, and she did them all. Give her a gourd, hot glue, and a skein of yarn, and there was nothing she couldn’t create. Her son was also convinced that she was the best cook on the planet. Joann also volunteered for several years as an election judge, a position she felt especially honored to fill. In addition, she worked several years at the State Fair as a judge in many of the crafting exhibits. She is survived by her son Darren Johnson (her rare gem), and several nieces and nephews, whom she loved and cared for deeply. She was preceded in death by her husband William Johnson; her parents, Goddard Joseph Gauer and Dorothy Genevieve Gauer; and her sister, Betty Mae Shammel. To plant a tree in memory of Joann Alvina Johnson, please visit our Tribute Store. Inurnment immediately following memorial service at Mount Olivet Cemetery. "Email Address" would like to share the life celebration of Joann Alvina Johnson. Click on the "link" to go to share a favorite memory or leave a condolence message for the family. Receive consistent support through our daily email to help you cope, heal, and grieve.